How do we judge how ‘good’ an eco-house is? By its ecological performance, what it feels like to live in it, how long it lasts, how much it cost? All of these are used, some formally in post occupancy evaluation, and others more informally in judging what worked and what hasn’t in new buildings. Post occupancy evaluation seeks the opinion of those who live (or work) in buildings, but too often eco-houses are judged just by their cost versus carbon emission savings, or how robust they are. While I am most interested in the balance between building a structure which is ecological as well as nice to live in, and thus tend to focus on people’s experiences and feelings about their homes, I know that we also need to measure the performance of buildings, especially in how they keep warmth in or not. 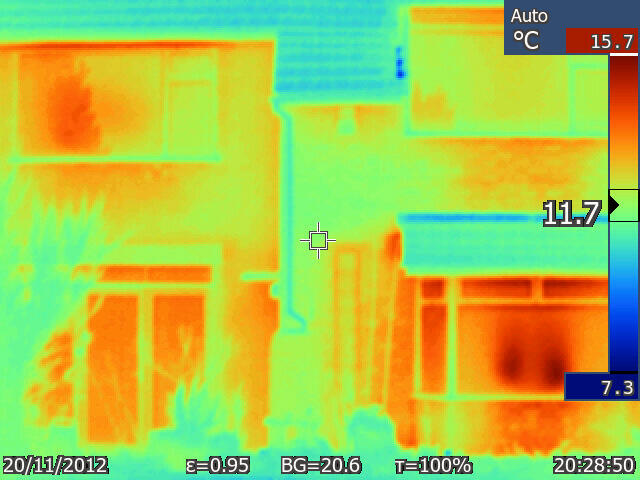 Recently I have been using a thermal imager, newly purchased by the Geography Department at the University of Leicester, to explore how much houses lose their heat. Comparing a straw bale house (in North Yorkshire) with a more conventional house in similar freezing temperatures it was clear to see the benefits of eco-building in terms of reducing heat loss. The conventional house leaked heat – with its external wall temperature as high as 15.9C, whereas the straw bale house external wall temperature was only -2C. Both houses where heated internally and where between 18 and 20 C inside. Notably the ‘hot spots’ on the image for the conventional house where were the radiators were on the wall – the heat was literally leaking straight out of the walls and windows next to the radiators. Of course, a thermal image only tells us so much. It cannot judge for us which is the most comfortable house to live in. We can assume that the conventional house leaking heat probably costs more in energy consumption, that it is less ecological, and that the internal temperature is more uneven. Likewise we can assume that the straw bale house has low energy costs, has an even temperature and is more ecological. But what does it feel like to live in? Does it feel warm and cosy? Which would people prefer to live in? All these are qualitative questions about feelings, emotions and expectations and cannot be measured by scientific results alone. We need to continue to develop creative ways in which to judge the success of eco-housing and not rely on measures of energy efficiency alone. Wow this is amazing! Why did humans ever move away from what worked in the first place?? That’s impressive… And I think the house on the right isn’t so bad to live in it. Good place to live + less consumming: it’s look like a great deal. Amazing – seeing the visuals really drives the point home. While I see your point about comfort, I am sure the straw bale home owners spend less money on construction, have less off-gassing from building materials and do a happy dance every time their utility bills comes. Thanks for this – its really quite striking. Very impressive results…I agree with Tara, why did we ever move away from this type of building? The simplest way to compare the heating efficiency of two houses is to compare energy consumption per living space area per heating degree day. It’s not as flashy as the thermal images, but it’s a very fast and cheap way to triage efficient and inefficient houses. Thank you, I agree, though calculating such figures requires accurate house size data and equivalent energy data across houses. 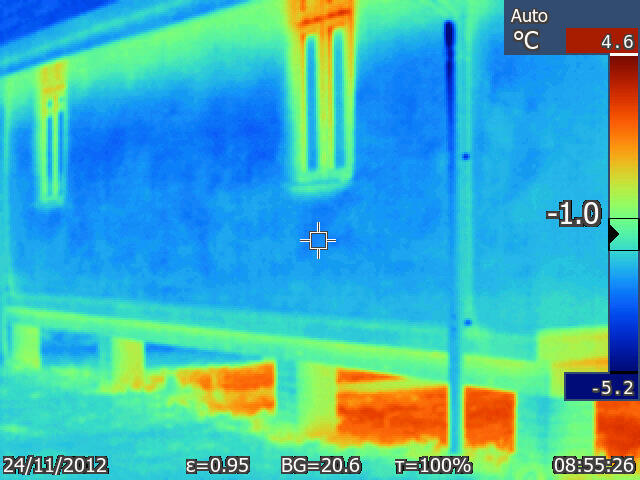 There is also something to be said for the power of a thermal image to communicate heat leakage. With global warming becoming a more serious issues every year, it´s time to make most constructions green!